When an opponent’s Spell/Trap Card is activated: Your opponent draws 1 card, also negate the Spell/Trap activation, and if you do, destroy it. Dark Bribe is a very simple Counter Trap Card that makes your opponent Draw a card so you can negate and destroy one of their Spell or Trap Cards. That’s it. Nothing related to any archetype. Nothing happening in the grave. With Grass Looks Greener gone, 40 Card decks might be 99% instead of 80%, so decking the opponent out might be an option. This card would help with that. Dark Bribe is definitely worth owning in triplicate, but it gives too much advantage to the opponent. There are other Counter Traps that work well or have archetypal advantage. It will always be relevant because it is an easy card to use, but easy is not always good. Score: 3/5 Art: 2/5 Nothing looks Dark or like a Bribe. We are taking a look at an old Video Game promo from Tag Force 2 this week for Throwback Thursday, Dark Bribe. Dark Bribe is a Counter Trap, the best kind of Trap, that lets you negate a Spell/Trap activation from the opponent and destroys the card at the cost of you letting them draw 1 card. Since this makes the opponent draw, this immediately becomes a minus one unless they paid some sort of cost. This can be a good minus one though if you negate the right Spell or Trap. This can stop something like Raigeki so you don’t get blown out of the water, Monster Reborn so you can’t get OTKed or let the opponent establish a bigger board, any of the Solemns so your plays can go through. Dark Bribe is still a solid Counter Trap, though it could get powercrept in the future and some archetypes even get their own form of negation already. Still Dark Bribe might have a spot in a future meta, so keep some just in case. Art: 1.5/5 Don’t take the bribe! Dark Bribe is our Throwback Thursday card, and this is/was…is and was (?) 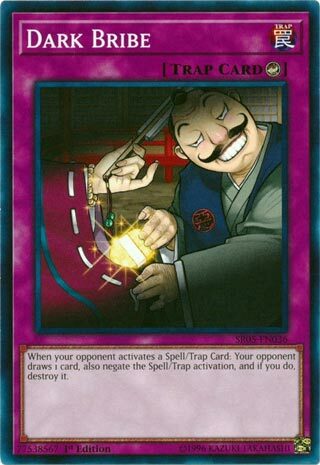 an important card in the game of Yugioh. Dark Bribe was one of the first cards commonly used in the game that people finally accepted that sometimes it’s all right to give your opponent a card, if what you negate really saves your hide. Normally, as a general rule, cards that negate/destroy (whatever) that involve your opponent getting a Draw, are/were disregarded. But Dark Bribe is powerful, and while being a -1 also, if you’re negating something that would wipe you out, even at the cost of this card and giving your opponent a card (technically a 1-for-1 for them) it’s all right. More or less, it’s one of those cards right now, nobody would fault you for playing, but there aren’t incredibly strong reasons to use either. But it’s a meta card, and could easily rise back to power. Art: 2/5 Not a particularly interesting or good picture.